Preventive care: Muscles can get stiff and painful when the spinal cord is misaligned. You can prevent these issues by receiving regular adjustments. Pain relief: We treat the causes of pain and not the symptoms. Drug free pain management: Customized Chiropractic treatments can be combined with other therapies to manage or eliminate pain without the use of drugs. This is one of many reasons why this is an attractive course of treatment for pregnant women and those wishing to minimize the use of medications. Better mental health: Proper adjustments combined with a healthy diet and exercise support your mental balance and clarity. They are also helpful in reducing stresses, both emotional and physical. 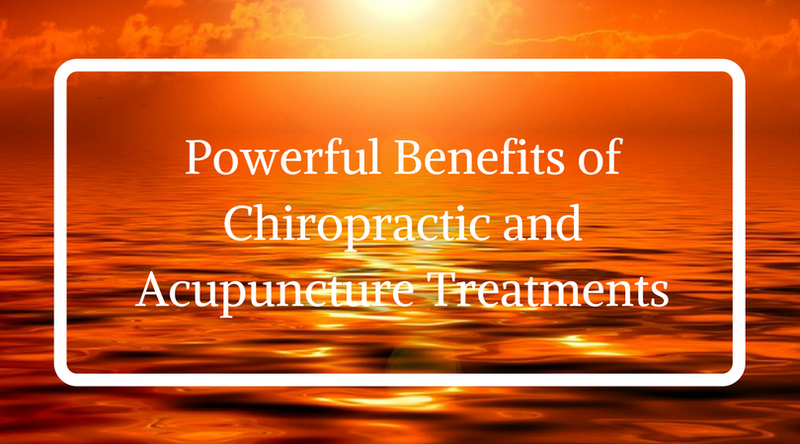 Acupuncture can be an effective component of a patient’s treatment plan. Acupuncture has often been used to treat pain, diseases and ailments such as headaches, back pain, menstrual cramps, arthritis, muscle pain and the effects of chemotherapy. received from Chiropractic and/or Acupuncture treatments.